Monday, my baby boy, 23 months old, had a lump on his hiney the size of a golf ball. The pediatrician felt it was too deep for her to lance in the office so we were scheduled for the surgeon the next day. A quick in and out procedure that I knew would bring him much relief. In the mean time he was crabby. Beyond crabby. In and out of sleep. Clingy. Pained. It broke my heart. My dad, hundreds of miles away, knew I needed help that evening so he called a local pizza place and had pizza delivered, paid for on his credit card. Wow. Dinner taken care of. An unexpected gift. What a fun, unique way to say "I love you. I am there for you." Then, at about 6pm, the fever came out of no where, 104.5. I rang the Nurse on Call and she spoke with the pediatrician. They agreed it was time to head to the Drama Room Emergency Room. So my sleepy, fussy, shaking and so uncomfortable baby and I headed out the door. We skipped a few people in line. The ER Doc said he wasn't going to touch this one and we were admitted right away. 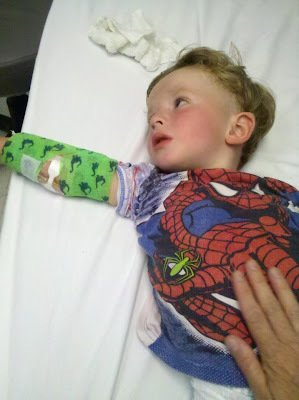 Baby Boy had a few blood draws, a lot of blood actually, and they left the port in for an IV. Two days in the hospital, countless prayers and little sleep. The golf ball lump grew to about 6 inches by 4 inches. Darn big for a 23 month-older's tush. It was hot, red-hot. The blood draw proved it was staph as I had expected. Baby Boy made it through surgery on Tuesday morning with flying colors. He hated the IV and tried to pull it out a couple times. He REALLY hated anybody that walked through our hospital room's door. A doctor, nurse, patient health advocate, you name it he screamed. I was his life line for 48 hours. Now Baby Boy L and I are home. We all need prayer at times when we know we can't do this alone. 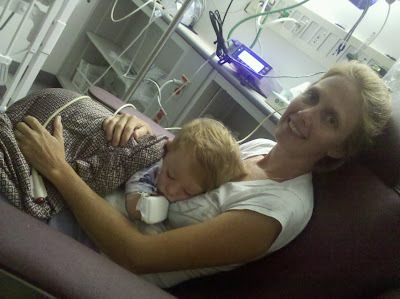 Tonight my 23 month old is in the hospital and I know that prayer from around the world (literally!) is helping me through this. What situation do you find yourself in asking for help from the most High-One? You all brought me to tears because my point wasn't, "boo-hoo for me". My point was what are you struggling with. Yet each of you reached out your arms and said, "Let's pray". Thank you! Thank you for being part of my military community. I know I felt that prayer because I felt strong in that hospital and it wasn't until I was home, in comfortable surroundings that I crashed. It was in that moment of crashing I realized that God had his arms around me the whole time, lifting me up, helping me be the mom I needed to be when my baby boy so desperately needed it. What do you do to help someone in time of need? Bringing over dinner (or ordering delivery in my case), to phone calls and texts, to prayers and petitions; they all have their place. Thank you for being there for the families that need it.